Please choose the color of the stain. 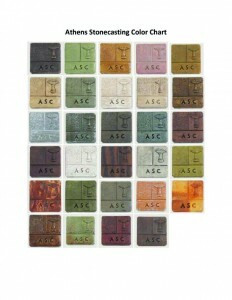 Please see Product Description for color samples. 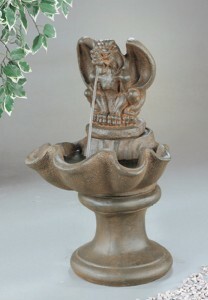 The 2 Tier Medium Seashell Fountain with Boy Holding Lily by Athens Stonecasting. 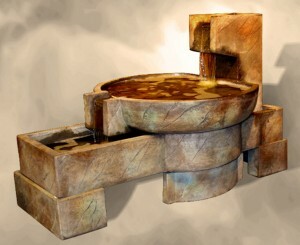 – Maison Decor only represents the best quality fountains available. 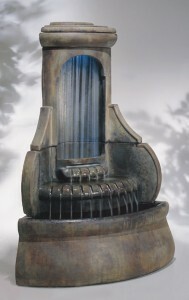 Enjoy this cast stone fountain for many years to come with minimal maintenance. All fountains include everything needed for operation – the pump, power unit and all parts are included with your order. 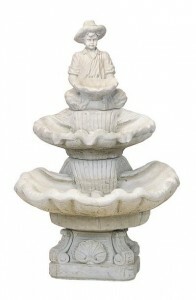 – Fountain Size: The 2 Tier Medium Seashell Fountain with Boy Holding Lily is 40 inches tall and 26 inches in diameter. It weighs 166 pounds. – Each Athens Stonecasting Fountain is made to order with your choice of unfinished or in 1 of 30 color finishes. If in stock at one of our locations, pick up would be available immediately. If not in stock, typically, within 4-5 weeks of placing your order your fountain will be shipped to Maison Decor for customer pick up. Or, arrangements can be made for Maison Decor to deliver and setup your fountain, for an additional charge, within our delivery area. Please call Maison Decor at 985.785.1710 for details.